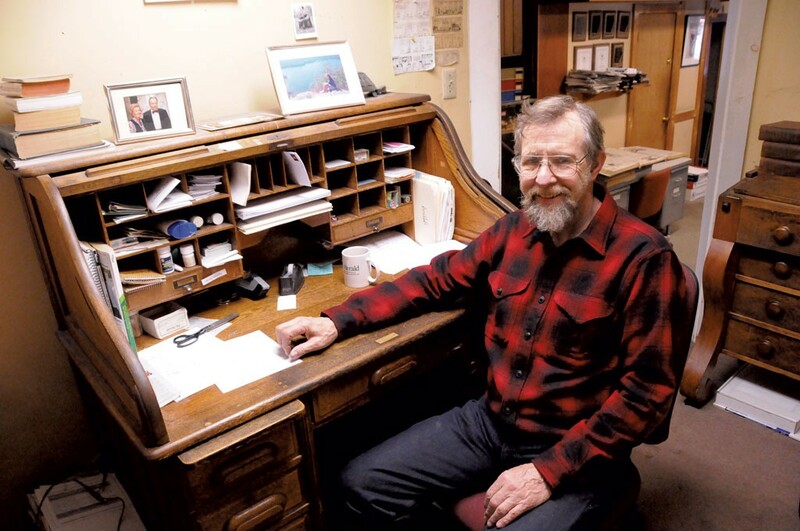 A year ago, when M. Dickey Drysdale was thinking of selling his newspaper, the Herald of Randolph, he dug into a leather satchel that he'd had since childhood and pulled out a batch of typewritten stories. They were pieces he'd saved over the years, ones of which he was most proud: features, editorials, obituaries and even poems about special Vermont events and people. Drysdale has turned these stories into a self-published anthology titled Vermont Moments: A Celebration of Place, People, and Everyday Miracles. The stories span half a century. Drysdale began his reporting career in 1966 at the Springfield Union in Springfield, Mass. From 1971 until June 2015, he was owner and publisher of the highly regarded Herald. His book is a testament to weekly community journalism done right. "I love writing. I think I am a better writer than a reporter," Drysdale said recently over coffee at the Randolph Depot, a restaurant near the building on Pleasant Street that has housed the newspaper since 1899. "I am not really a newshound who digs and digs and digs." Yet spade work he did. Even features require labor. Drysdale produced maybe a half dozen stories each week over some 2,200 weeks in Randolph. Most of the poems in Vermont Moments were penned some 15 years ago during what Drysdale called his "fertile period." They are concise, carefully crafted observations and, like his prose, deal with meaningful or amusing incidents in daily life. "I opened up the satchel and found a zillion moments of happiness, sadness, adventure," he said. As the son of newspapering parents — his father bought the Herald of Randolph in 1945, and his mother was its local columnist — Drysdale got an early start in the profession. At age 10 he shoveled the building's walks in winter; in high school he put mailing addresses on papers hot off the press. In 1966, after college at Harvard University, Drysdale took a job at the Springfield Union, where his father had once been a reporter and his mother's father had been editor. One day in 1967, Drysdale happened to cover the Marlboro Music Festival in Vermont. It was a big event, captured on network television, and featured pianist Rudolf Serkin and cellist-conductor Pablo Casals. Then-vice president Hubert Humphrey was in attendance. In addition to Mozart's Haffner Symphony, Drysdale wrote, the crowd was treated to an extreme demonstration of police and secret-service surveillance. The young reporter noted that the Windham County sheriff, for security reasons, had warned a couple they couldn't open their picnic basket. Still, the music was extraordinary, and Drysdale wrote that Casals received a better reception than Humphrey did. The reporter's satchel got one of its first stories. Drysdale, who sang in the Harvard Glee Club and for years led the Randolph Singers, wrote authoritatively over the decades about music. He covered all kinds of events, from a Blanche Moyse Chorale concert in Hanover, N.H., to an automotive orchestra (think tooting horns) on the village green in Rochester. Journalism can also be an occasion for daring, even for the publisher of a weekly. Drysdale wrote about an exhilarating flight in a hot air balloon during which he brushed the top branches of an apple tree and nearly plunged into a farm pond in South Barnard. Another time, he talked the Vermont Air National Guard into giving him a ride on a Phantom F-4D from Burlington to Fort Drum, N.Y., and back. On its mock bombing mission, the plane banked and swooped and climbed. Drysdale threw up, though fortunately not in his oxygen mask or helmet. His story would have done George Plimpton proud. 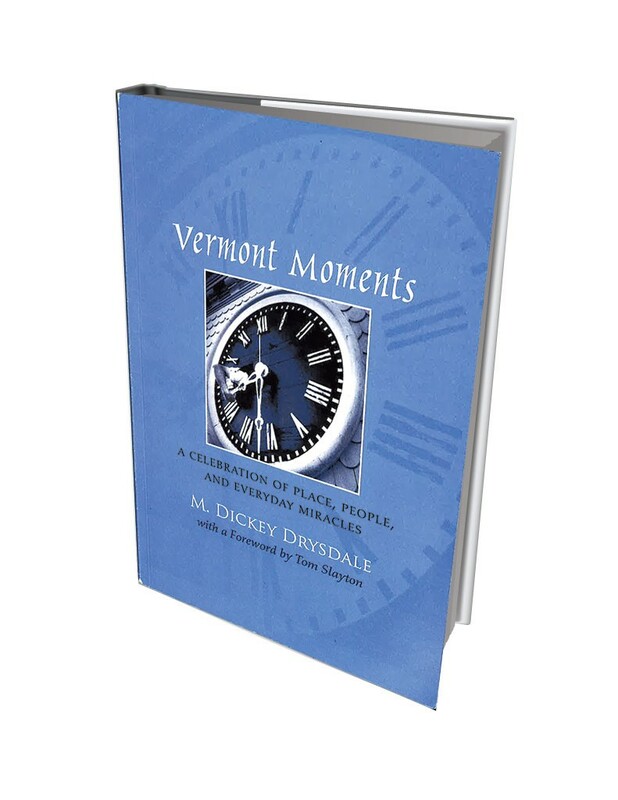 Vermont Moments: A Celebration of Place, People, and Everyday Miracles by M. DickeyDrysdale, self-published, 180 pages. $16. An occasional obituary writer, Drysdale honored lives well lived. Vermont Moments includes his tribute to Richard Mallary, a Dartmouth graduate, farmer, former state senator, speaker of the Vermont House and congressman during the Nixon administration's Watergate scandal. Mallary, he wrote, "had a thoughtful moderation that made it clear why he was elected so many times." Of course, at times Drysdale had to address the vicissitudes of Vermont weather. Vermont Moments has an essay that Drysdale penned about a trip he took to Middlebury via the Route 125 gap road on a rainy day in early December with his wife, Marjorie. She was concerned about possible icy conditions; Drysdale forged ahead anyway. Finally, after both agreed that turning around might allow them to live longer, they nearly slid off the mountain road several times. The couple walked the final mile home. The piece is peppered with dialogue in spots, but not an "I told you so!" — though that might have been appropriate. "I got a great reaction to that story," Drysdale said. "It was about the silent tension between the driver and his wife." Sometimes, as his collection illustrates, reporters benefit from plain old luck. One day in 1988, Drysdale set out to write about the life and death of Charley Spooner. The reclusive fellow had lived alone on his farm for more than eight decades, and had 10 dogs and a collection of rocks with markings he considered sacred. Spooner was viewed as a character, possibly even a kook. He claimed he had never in his life spent a night away from the farm. Drysdale recalled in the Depot interview that he hadn't known how to begin reporting that story. But, as good fortune would have it, he received a surprise visit at the newspaper office from two of Spooner's neighbors, who revealed many "splendid truths" about him. The resulting piece was a colorful, moving tale about a generous and kind Vermonter who cared for his aged mother, actually welcomed visitors, relished his independence and was at peace with his small but wonderful world, before he was found dead in a chair in front of the woodstove. "Charley Spooner died as independent as he had lived," Drysdale wrote in his lengthy feature story. "Right up until the last week of his life, he kept a cow and did his chores." "I was just lucky to see those two guys," Drysdale said. "I asked them to talk about Charley Spooner, and they ate it up." Luckily for Herald readers, selling his newspaper doesn't mean Drysdale won't still be writing. He has a deal with the new owner-publisher to continue reporting on a part-time basis. Who knows what's next for that leather satchel? 1. There's a lot more water in there than you think. 2. However, there's not quite enough water to cover the rocks. 3. There are a lot more rocks in there than you think. 4. Shouting at the canoe will not make it turn to avoid the rocks. 5. Shouting at your partner will not make the canoe turn to avoid the rocks. 6. The current moves considerably more rapidly than you might think. 7. Sometimes white water indicates the presence of a rock, but sometimes it does not. 8. Sometimes the presence of a rock is indicated only by the thump of a rock on the bow of your canoe. 9. Canoe paddles can move right along down stream all by themselves. 10. When you are broadside to the river, it is very easy for the current to flow right into the canoe. 11. Canoes tip over easily. 12. The water in the White River in May is cold for swimming. 13. An overturned canoe, wedged against rock with the current flowing into it, weighs several tons. 14. Jack Kennedy over in Chelsea has a power winch that is about the only thing which will get a wedged canoe out. 15. It takes a long time to get warm and dry again. Bill Burgess was a great town manager. Not for the longest time. The original print version of this article was headlined "Writing Life"